A boutique nail and beauty bar isn’t the obvious location to interview a footballer of international standing – but then Jayeih Saelua is no ordinary footballer. A 6ft 2 central defender for American Samoa’s men’s team – Jayeih is known for crunching tackles and crucial goal line clearances. But Jayeih also has long vermillion nails and sleek glossy hair that reaches almost to the small of her back. Jayeih is transgender – in lay terms, a woman born into a man’s body. A woman whose parents gave the name “Johnny”. Her team – American Samoa – were previously known as the side that infamously lost 31- 0 to Australia in a World Cup qualifier. But that was before a new coach revitalised the team and recruited new players. One of whom is Jaiyeh – who has accidentally become the star of a new documentary ostensibly following the team’s on field fortunes. And “Next Goal Wins” also tackles an issue at the cutting edge of sport. Jaiyeh is the world’s first transgender footballer to play on the international stage – not just in meaningless friendlies, but in the world cup qualifiers. Jaiyeh is in London to promote her film. While a beauty therapist fixes a broken nail and massages moisturiser into her palms, we discuss who is going to win the World Cup. It’s hard to imagine someone like Jaiyeh ever playing for the England men’s team. But American Samoa is rather different. For when she first took the field, Jaiyeh says no-one (on the home side at least) batted an eyelid. Because she is what Samoans call Fa’afafine – the third gender. Jaiyeh explains that “respect” is so ingrained in Samoan culture that people like her are expected, just like anyone else, to be “comfortable in their own skin”. Everyone, be they male, female, gay, straight, or trans, are expected to reach their potential in life. And Jaiyeh’s talent turned out to be football. A world where – in American Samoa at least – she says she has experienced no ignorance or prejudice whatsoever. There’s been “zero discrimination”, she says. Either from her teammates, or the local administrators who run the game. Aeries Houlihan can’t quite believe it. Like Jaiyeh, Aeries was born a man. Now, she is in almost all respects, a woman. Her passport and her driving licence both state her gender as female. But she plays her football in Leeds, rather than the South Pacific. And Aeries finds herself caught in the limbo of regulations that are a decade out of date. It’s not something mainstream sport has had to tackle until recently – for trans athletes present sport with dilemmas moral and medical. Particularly for women who began life as biological males. The obvious question is does being born a man not bequeath a permanent biological advantage? Jaiyeh delayed her “transition” so she could continue playing the football she so loves. Her hormone levels are still very “male” – she is still very strong and fast. In the first match under American Samoa’s new manager, they won. And Jaiyeh was named (wo)man of the match for her sterling defensive efforts. But she still lives as a woman. She wears glamorous dresses, and uses laser treatment to limit her facial hair – but she has not yet had any surgery. Neither has Aeries.However she has been on advanced hormone treatment for well over a year, and now has the same testosterone levels as any other woman. Testosterone is the key hormone that gives males stronger muscle, and bone. The last time she played against men, she got injured. But Aeries has been told by the football authorities that she can’t play football for her local Sunday league women’s team until she’s first been under the knife, and then waited for another two years. She’s frustrated and upset. Aeris can’t believe that she’s being made to wait, when medical science, her teammates, and she says, the teams she would be playing against if she was allowed, all suggest she should be allowed to play. On a rainy evening at the local football field she explains her anger. “My team are about to start training – the FA did say I shouldn’t really even be training. But the girls and management wouldn’t have it any other way – I’m one of them, you know”. The FA rules were drawn up a decade ago by the International Olympic Committee. And since then medicine has made big advances. Does being born male confer a permanent physical advantage over females of a similar size and shape? The consensus now is that surgery is by and large cosmetic. The key determinant is testosterone. Some sports have already changed their guidance. Badminton and hockey have. And football in some countries – like Canada – have too. But here – not yet. Although the FA says it is currently reviewing its rules, and may well introduce a change soon. Which is of course good news for the likes of Aeris. And, it turns out, potentially a significant number of others. There are thousands of trans adults in the UK currently in “transition” from one gender to another. Clearly not all of them will be interested in donning a pair of footy boots of a Sunday morning. But one of the key factors that effect the speed and success of making the transition from one gender to another, in particular when preparing for surgery, is health and fitness. Delia Johnson who advised both the London 2012 games and now the FA on trans issues, runs something called Transsexuals in Sport. She says on health grounds alone, we should be encouraging the trans community to take part in sport, not making it harder for them. Privately many in the FA see this as an opportunity to take a progressive position on a matter of not just moral but legal import. But the key challenge is one of ignorance. Discrimination against transsexuals is illegal. Funke Awoderu is the FA’s Equality Manager. “We have a community that wants to engage”, she says. “We have to find a way to welcome them – particularly at the grass roots – but remember, we have a volunteer workforce who may not have come across a trans person before”. For an industry that has very public struggles with its commitment to social justice, dealing with transphobia is a big challenge. “Next Goal Wins” went down a treat at a special screening organised at Wembley by the FA. Guest of honour – Jaiyeh. She said she burst into tears when she first walked out to the hallowed turf. “Not many people from American Samoa ever get to visit the home of football”, she told me. In 6 inch heels and a figure hugging pencil skirt she cut a very refreshing figure as she disappeared down the tunnel to the show. But not before remarking on the wider significance of her journey. When the film crew first started following American Samoa’s remarkable transformation from perennial whipping boys to contenders, she said she was amazed they were so interested in her. “I was under the impression that in other countries – there are others like me” she said. 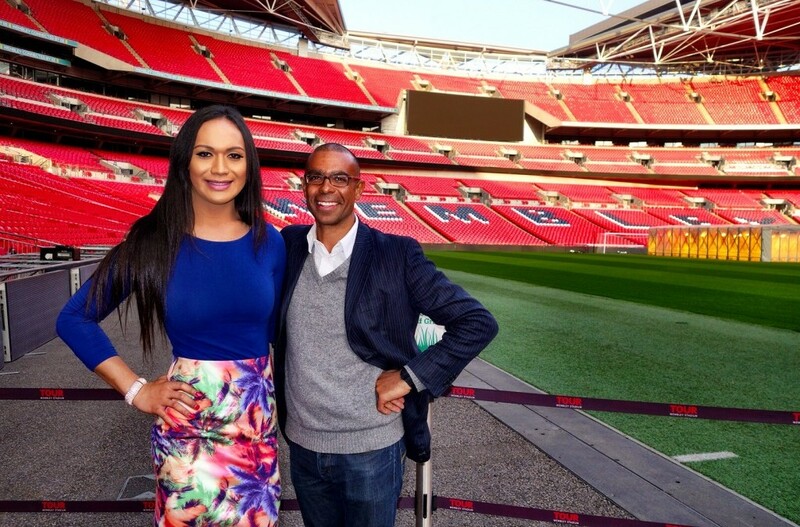 “In 2011 when they told me I was the first [transgender international footballer] in the world – I stepped back. I realised that maybe this world isn’t as cookies and cream as I thought. It’s sad”. Great pic. Wish there were more. I luv similar pics. I’m Black and adore ladyboys! This is a very informative article. It pulls at the heart. Great job!! !